Summary: Jasper is about to become the saving grace of the harpy she wolf - something he didn't ask for nor does he want. Of course Leah isn't going to go down without a fight, but how do you survive this fight when your own kind has turned their back on you? I was never much of a Jasper fan in fics. I always found him to be written as a side kick or a puppet in many stories with no actual characterization. I don't get that. Think what you want about the Twilight Saga on a whole, SM wrote such an interesting and diversified background on Jasper and stuck with it through all four books. But for some reason, the fandom just didn't play it up, unless of course he was written as evil or maniacal, which is artistic license only and not the actual character. Then there's slash fics. The slash writers for some reason do see the depth to him and run with it. But you so rarely see it with M/F stories. The other issue I have with Jasper fics is Alice. Sorry to all the Alice fans but she has ruined many a fic for me causing a flounce. And that's as a secondary character. That's how irritating I find her with many fics when she is written so over the top and overbearing. So my familiarity with Jasper fics is not quite there and why you don't ever see me rec'ing them. Obviously I can't rec what I don't read. She is also an amazing graphic artist as you can see her banners on my site. But I have never read her stories, until now. You Better Learn To Crawl is a Leah/Jasper story. It is only two chapters in but what powerful chapters. The story starts out so strong and packed with realistic drama that it is a Jasper I can get on board with. This is a dark and gritty Jasper. A Jasper with a dark and diversified background coming front and center. Just as SM wrote him and PMU has taken up the reins and is running with it. He is canon in the truest sense of the word. Obviously not a canon pairing, but his characterization is. I pull back and look her in the eyes. She looks soft, broken, almost like a fallen angel. My frozen heart clenches tightly within my chest; in that moment, I realize that she has stolen something from me, something I didn't know I had…. "You can't walk away from me." she whispers. Her words take their toll on me in a way I never felt before. "Never." I reply, because that was the only answer I knew how to give. 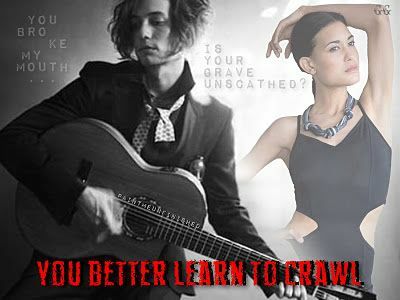 You Better Learn To Crawl has drama, action, surprises, and heartbreak. This from only two chapters. My interest is piqued and I am sitting on the edge waiting to see what happens next. PMU has assured me chapter 3 is in the works. This is definitely a story you want to put in your alerts. It gives you a story line so different than the usual Breaking Dawn fic and a Leah and Jasper that will make you smile. Their interaction is amazing as is the chemistry. It is believable. Note though, the story is not fluffy by any means. I do not expect it to take that turn either. They are dominant characters and anything less would be a disservice. It is dark, gritty, and powerful. I am also adding this story to our No Boundaries community. It completely exemplifies Leah in her truest sense and is definitely a story with "no boundaries". you flatter me with such pretty words .... I had no idea you where posting this .... it was amazingly sweet :blushes: ... thank you for reading it and now rec'ing. I hope that others will see and feel the same way you do about it in the context of Jasper being very canon. I also am very happy to have broken the " not very Jasper like" mold in your reading search for Jasper / female fics!!! .... Hopefully I will continue to keep you intrigued.